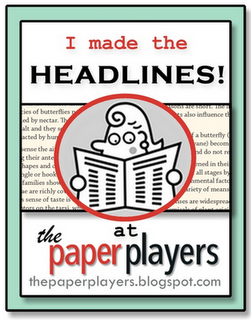 A big Paper Players' "thank you" is going out to all who entered Ann's Christmas in July Challenge: Challenge 102! Your entries were amazing and they certainly put all of us in the holiday spirit...despite the oppressive heat in many locales! 1. 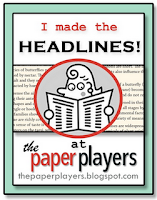 Dawn's Choice: Victoria's sweet penguin card created with the owl punch from SU! Loved the scene she created as well! 2. LeAnne's Choice: Tenia's reindeer on a woodgrain background is tres chic with his red nose!!! 3. 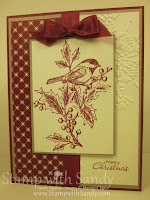 Jen's Choice: I love Terri's clean and simple card with its embossing and sweet little birdie. It makes me almost ready for snow! 4. Amy's Choice: Lisa's mix of Cherry Cobler and the soft Crumb Cake background works so perfectly with the ornament image she has chosen - perfect blend of CAS and Christmas! 5. Anne Marie's Choice: I just loved Allisa'a elegant skater card with the monochromatic colors and the icy sparkle of the bling. Just gorgeous! 6. 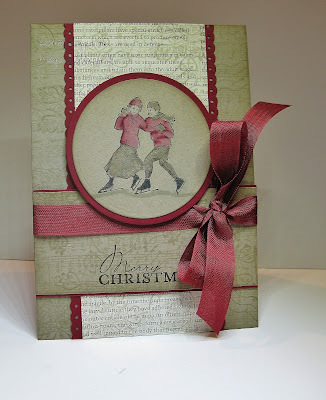 Vicki's choice: Nicole Blalock-I loved Nicole's use of a non traditional stamp set to make her Christmas card , with a fun layout and pretty bow. 7. Jaydee's Choice: What's not to love about Alyson's beautiful card! From the scalloped circle shape to the pink ribbon and the glittery star, it all comes together in a beautiful cohesive whole. is Sandy, whose card is elegant & timeless. bow to top it all off! Thank you very much for choosing my card! 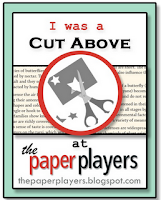 Congratulations to the other Cuts Above and Headlines! Thanks so much for picking my card, gorgeous entries! Jen, thank you for selecting my card! Congrats to all, such wonderful Christmas cards! Thank you so much Amy, I am glad you liked my card! Congratulations to all the ladies, such amazing Christmas cards! Thanks so much, Ann, for choosing my card. So exciting! Congrats to the other winners. Such gorgeous cards. 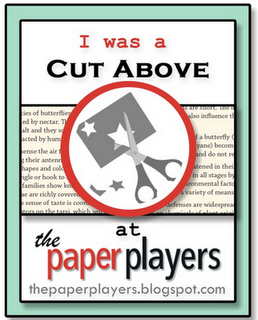 Thank you so much for recognizing my card! So much inspiration out there for all the other Christmas cards still to be made. Congrats to the winners and thanks for choosing my card too!! Yay!! !